By nature, I am a person who thoroughly enjoys organization and routine. I hate being late and I like to have plans laid out well in advance. That’s just how I roll. So, for me, getting into a healthy eating routine was probably the easiest thing for me out of the whole weight loss thing. If I sit down on Sunday, plan my meals for the week, and then go grocery shopping, I’ll generally stick to that plan. When I was still in school, I ate whenever and whatever I felt like. There was no routine because everyday was different. A different schedule of classes in a different set of buildings at different times. Factor in the lack of sleep and stress, and it is clear how detrimental college life is to the average 20-year-old. Only kidding. I just lack discipline. Again, only kidding. 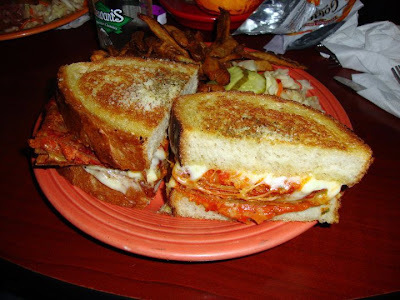 (That, by the way, is a delicious grilled cheese sandwich with lasagna, that’s right, lasagna from an excellent restaurant called Melt in Cleveland.) If I ate that for lunch every day, my weight would be moving in the opposite direction and I’d be shopping for new pants for all the wrong reasons. Getting into a healthy eating routine, one that does not involve daily consumption of lasagna sandwiches, really does help. 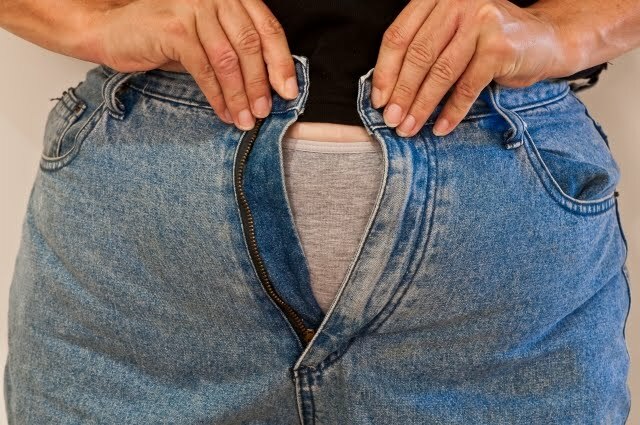 And, it also very much helps to change your lifestyle, which is the most important part to keeping weight off. So, plan, plan, plan, and stick to it. Also, I bring my lunch to work everyday. Yes, everyday. If it’s with me at work, the many drive-thrus surrounding my office are much less tempting. This was very, very helpful for me. Plus, I saved mucho dinero. So, brown bag it to work!